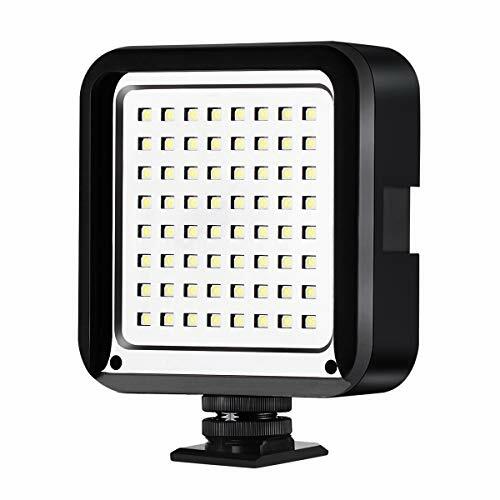 PERFECT DESIGN LED VIDEO LIGHT: CofunKool LED Video Light is Designed with Expandable Connection System via 2 expension joint interface (1 interface on the top, 1 interfaces on the side) to connect multiple light panel together to strengthen lighting brightness and to get better lighting effects. UNIVERSAL FOR CAMERA CAMCORDER: Fits Canon, Nikon, Pentax, Panasonic, Sony, Samsung, Olympus and other DSLR cameras and camcorders; Can meet much higher level macro photography including nature, medical, scientific photography, portrait photography whether you are a professional or hobbyist. STABLE COLOR TEMPERATURE: Consists of 64 pieces highlighted LED Lamp beads, providing optimum illumination and diffuser. LIGHTWEIGHT AND PORTABLE: With it\'s lightweight and durable construction, you can carry this light around with you wherever you go. The layout allows for quick, easy adjustments to be made so you never miss that perfect shot. 100% GUARANTEE: It can be powered by 4 AA-batteries; Highly efficient, power-saving, low energy consumption. (Battery Not Included); Zero Risk to Buy! 100% money back guarantee. If you are unhappy with the LED VIDEO LIGHT for ANY reasons, we offer new replacement or full refund WITHOUT return. Very impressevice for my camera.